I've got another "recipe re-do" for you this week! I love resurrecting old recipes on the blog. In case you weren't a follower way back when when I first posted these recipes, you'll get a chance to see some of my old favorites come to life again! I made this recipe this past week and was again reminded of HOW YUMMY this bread is. It's a recipe from my mother-in-law (also strange to say that - but in a good way!). Mike adores this bread, and I can see why. I really need to remember to make it more often! It comes together very quickly, especially considering that it is a yeast bread. It's very simple and tough to mess up, I promise. 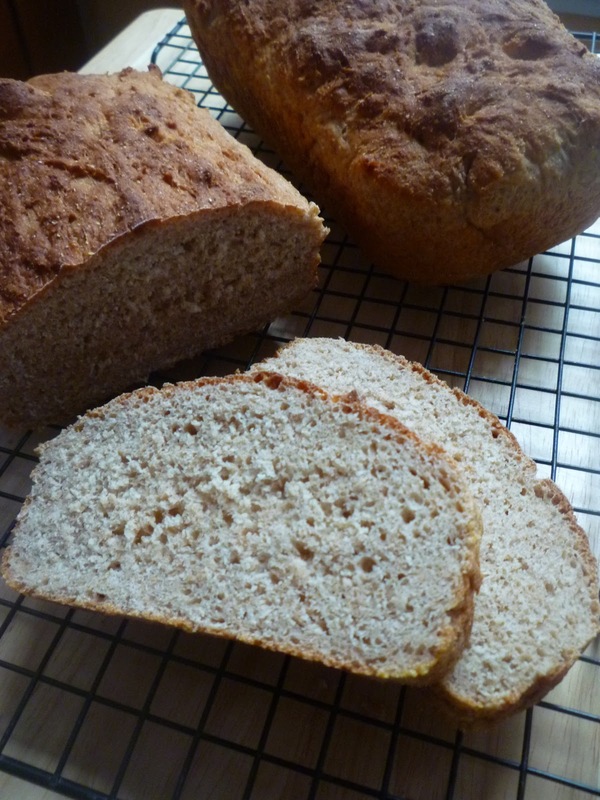 If you're intimidated by yeast breads (I still am somewhat...), then this is the recipe for you! Prepare two loaf pans (8 x 4 or 9 x 5) by spraying with cooking spray and sprinkling with cornmeal. Set aside. Combine 3 cups of the flour, sugar, salt and baking soda in a large bowl. Heat the milk and water together on the stove until warm (about 120 to 130 degrees F). Add the liquids to the dry ingredients and mix well. Stir in more flour, by the 1/2 cup or so, to make the dough stiffer, until you reach the total of 5 to 6 cups of flour (remembering that you already added 3 cups to start!). You may mix this dough by hand, or you can use a food processor. I prefer to mix it by hand (just so that I don't dirty more dishes). But if you do mix it by hand, you should knead it for a few minutes before putting it in the pans. If you use a food processor, you can skip the kneading. Divide the dough in half, and spread each half into each of the two prepared pans. Cover and let rise in a warm place for at least 45 minutes. Preheat oven to 400 degrees. When the dough is done rising, bake in the preheated oven for approximately 25 minutes (but oven times may vary, so I'd recommend you check your bread after 20 minutes). Let cool in pan for 10 minutes or so, and then remove breads to cooling rack to cool completely. See that green knife? It's the best bread knife I've ever had! Really. The Best. We love it. You may be able to tell that I took pictures of this bread after Mike and I had already eaten part of one loaf (it's not just that the loaf in the bottom of the picture is significantly smaller ;)). We just couldn't keep our hands off it when it was out of the oven!! This bread is amazing if you toast it! I love it with a little bit of butter. I've also been enjoying a couple slices each morning this week with some peanut butter. Jam is fabulous as well! Honestly, you can't go wrong with any topping on this bread. We seriously love this bread. I really hope you will try it - I just know that you will love it too!! Have a fabulous weekend and St. Patty's Day, friends! If you need any last minute ideas for recipes, check out my St. Patrick's Day recap from last year.